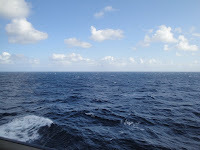 As the Queen Mary 2 left Southampton, England, we went to Commodore's Club, a lounge on deck nine with a front facing view, and played our daily game of Rummy while watching the last vestiges of land disappear from sight. For the next six days (seven nights as the cruise lines count) we would be heading for the colonies and home. What would we do over the next few days with no ports to visit, no land to see? It didn't take long to fall into something of a routine. Our first day out was relatively calm and even sunny so we started with a nice breakfast in the Britannia dining room and a nice leisurelyl walk on the Promenade Deck. Three times around the ship equaled one mile. Then it was off to do some laundry. Laundry, you say? Yup. Even on vacation I get to do laundry. There was a laundry special one week of our cruise that was 30 pieces for $30 dollars-a bargain and we took advantage but we needed a little more to get us by and the laundrettes on the ship were free and even provided soap. You just had to queue (get in line) to wait on one to finish which provided quite a lot of entertainment. Those who left their laundry and didn't return in time often found it left in a basket on the floor, which led to British terms of "endearment" that I often didn't understand. I made sure to return just as the washer/dryer was finishing. The afternoon for me offered a wonderful concert by a classical guitarist. Bob enjoyed the workout in the gym and relaxation in the spa. Of course on board the QM2, any day at sea is a formal night and dress codes are strictly kept--or as strictly as possible without causing a scene. We did get one break midway with a semi-formal night (dressy outfit for ladies, tie and jacket for men) and the last night was "elegant casual" (no jeans, jacket but no tie for men). Our evening entertainment included several production shows by the entertainment staff. My favorite was one featuring the dancers who were mostly from the Ukraine and Russia. They were tremendous--especially with the folk dances. Other entertainers included a comedian/magician, the Rat Pack (Sinatra, Davis, Martin impressionists), and a lady who played several different instruments. The lounges featured a jazz band, string quartet, harpist, pianist, etc., and if you couldn't find something to your liking there, you could take in a movie. Some of the newest releases on DVD were shown including The King's Speech. The following days included lectures on the royals (there was of course a wedding to be talked about), various aspects of air travel (including some truly funny stories about traffic controllers around the world), a port talk about New York City, and several others I can't begin to remember. Art auctions, bingo, Dixieland band, ballroom dancing (the QM2 has the ocean's largest ballroom), afternoon tea, and the list goes on, and included special services for Good Friday and Easter. As the days went on however, the weather deteriorated. Seven to twelve foot waves, cloud cover, rain, drizzle, and eventually fog. It felt like home came to meet us. The seas did not make a big impact on the QM2. She is built to take it and except for a slight feeling of motion, she rode the waves quite well. One of the nicest things about a transatlantic at sea is that you gradually change the clocks as you pass through the time zones. No jet lag although is does mess with your body clock a bit. We arrived in NYC very early in the morning. . .but that's for another post--tomorrow.